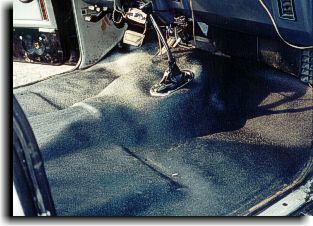 A custom fitted cut and sew carpet installed in a 1965 Ford P/U. Without seal plates to finish the edges, the carpet had to be cut carefully and edged to finish the edge of the door opening. 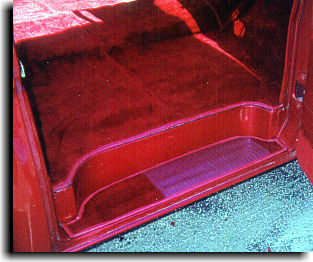 Also, a special carpet section was installed in the step with a heel plate for durability. 1) Form fitted carpet - This is a carpet that is manufactured by after market companies that make the form of the floor pans of the truck. This type of carpet requires no sewing and fitting and has no sewn seams for the fit. 2) Cut and sew carpet - This is when a upholstery shop will buy yardage of carpeting and tailor fit the carpet to the truck. 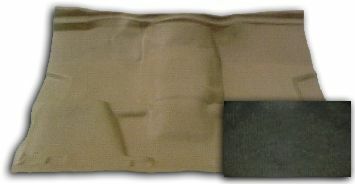 This is required with special custom fitting requirements for the vehicle or if a form fitted carpet is not available. 3) Stretch carpet - This is a type of carpeting that has no backing and will "stretch" to make a fit. This type of carpeting is usually used to glue over an existing carpet. This carpet is cheaper to buy and install. It looks good when installed but usually will not last long because of not having a backing for strength. If this type of carpeting is used, it should be done with the full knowledge of the consumer for its advantages (cost) and disadvantages (durability). If a consumer has a new carpeting installed in a truck, the best way not to be taken advantage of with this type of cheaper carpet is to request the old carpet from the truck. Whatever type of carpeting is used for a truck, Catalina Custom always recommends a set of floor mats to help take the abuse where the heaviest wear will consistently occur. Custom floor mats can be purchased with special logos installed. 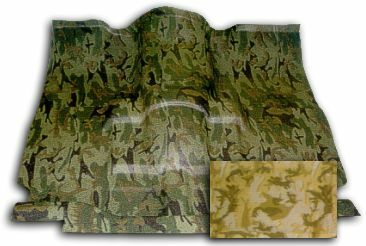 Also available for truck carpeting, Catalina Custom installs clear vinyl over the existing carpet to protect the carpeting from harsh working environments. This has been done when a customer will be working with liquid materials that can stain carpeting and trades in the trucks every 2-3 years or so. The factory carpet is removed from the vehicle. The clear plastic is then folded over the front, rear and sides of the existing carpet and taped on the back side. When time for the truck trade-in, the clear plastic is removed and the carpet is like new underneath. Unique for truck flooring is form-fitted full rubber floor mats. As seen below, these are available in a choice of green or tan camo design and black or tan solid color design. 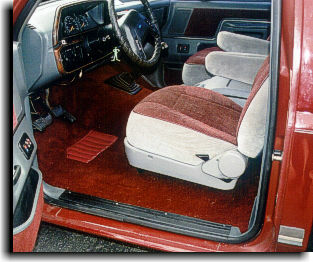 A form-fitted carpet installed in a Ford F-150 P/U. Notice the factory OEM heel plate installed in the carpet. More examples of truck carpeting may be viewed in the Truck section of the Showcase Gallery. Any questions about truck carpeting - Contact Us.